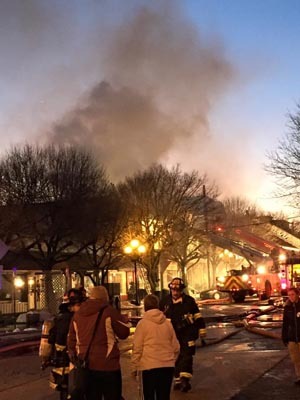 The Fri., Feb. 6, 2015 fire at 50 Main Avenue in Ocean Grove. Photo by Richard Virgilio. After a fire destroyed the three-story commercial-residential buidling at 50 Main Ave. in Ocean Grove in February, The Phoenix is rising. Within the next few weeks construction should begin on a new three-story building — The Phoenix — on the site, according to Kurt Cavano, who owns the property with his wife, Janet Mazur Cavano. The two have been Ocean Grove residents for more than 30 years. Now, the Cavanos are in the process of filing for building permits, Cavano said. The new wooden building will be 12,000 square feet over three floors and a basement. It will be built on a smaller footprint of about 3,000 square feet — or more box-like, whereas the previous building was L-shaped with a wider first floor. The new building will have three commercial spaces and a restaurant space on the ground floor, Cavano said. The Cavanos’ Fusion Jewelry will return, while Smuggler’s Cove gift shop is expected back and Yvonne’s Cafe has expressed an interest in returning, Cavano said. The second and third floors will have a total of six apartments, with the second floor also having a mezzanine extending from the first-floor restaurant, Cavano said. The Cavanos are now seeking Neptune’s approval to use the basement for a “MakerSpace,” a publicly accessible workshop for do-it-yourself projects. The plan is to have the structural work on the building done by winter, so workers, then, can work inside, Cavano said. And the building is to open by 2016’s Memorial Day, the traditional beginning of the summer season. Cavano said the new construction will cost more than $1 million. The old building was listed at 8,420 square feet, but Cavano said it was unclear what the actual square footage was. It had seven apartments on the second and third floors. The cause of the fire was never determined because of the damage to the building, but it was considered non-suspicious. It started in a second-floor apartment, Cavano said. The Cavanos also own 48 Main Avenue, a two-story building next door. That building suffered fire, smoke and water damage. The two apartments on the second floor are re-inhabited, Cavano said. Work is still being done on the first floor, which had been occupied by the Barbaric Bean Coffee House. Barbaric Bean is not coming back and the Cavanos are looking for a restaurant to occupy the first floor. Posted in Uncategorized and tagged Joe Sapia, Ocean Grove.